CILcare will be attending MassBio’s CRO/CMO Symposium on September 6th, 2018 in Boston. Meet Aurore MARIE, CILcare’s R&D Project Manager, to learn more about cutting-edge GLP preclinical services we offer to developers of auditory therapies. CILcare and CBSET combine scientific excellence in otology with experienced, GLP-compliant, preclinical experience to reduce risk in your regulatory filings. From general toxicology studies to surgical services, our team has the capability to customize a full preclinical program in line with your IND approach and project milestones. The collaboration between CILcare and CBSET creates a highly experienced team offering complex transtympanic and intracochlear drug delivery methods which limit systemic exposure and provide robust, reproducible data in support of your ototoxicity or auditory function program. 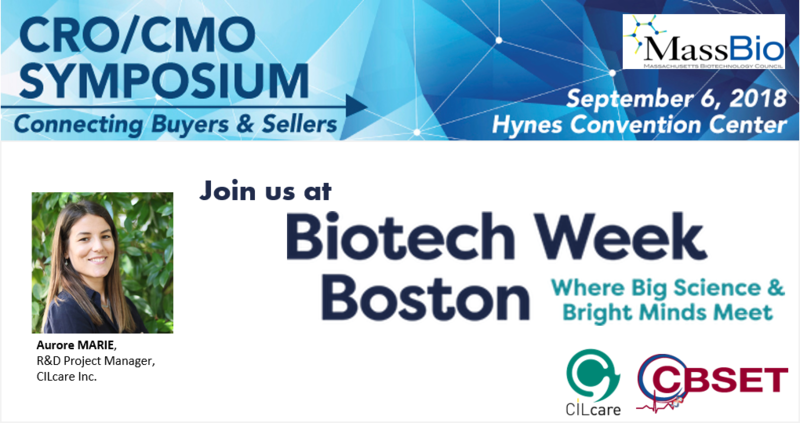 For the second year in a row MassBio’s CRO/CMO Symposium is joining forces with Biotech Week Boston for this year’s event. This symposium has historically gathered over 300 attendees to discuss and evaluate the best practices in shortening time to market. This year, as part of Biotech Week Boston, we invite Pharma and CRO/CMOs to join the conversation. Through a series of conference-wide panel discussions and breakout sessions, we will evaluate the strategies that have evolved in outsourcing and strategic partnerships in pre-clinical, clinical and manufacturing, and commercialization. The program will also include a well-trafficked Exhibit Hall, significant networking time during breaks and a closing reception.